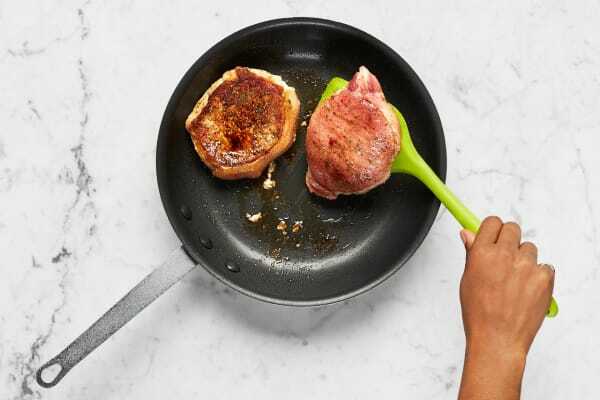 These pork chops are rubbed with our blend of cinnamon, cumin, and … magic. 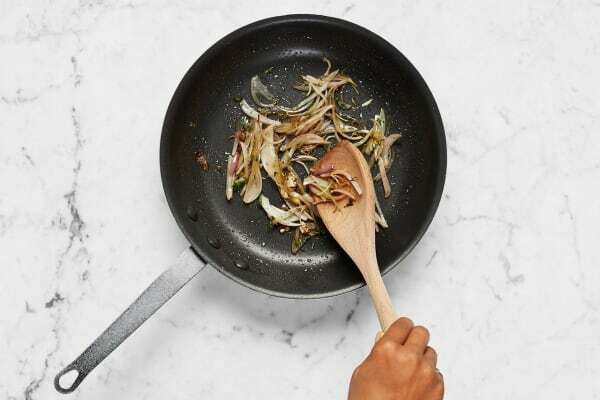 They’re seared until golden, then topped with a luscious pan sauce. On the side? 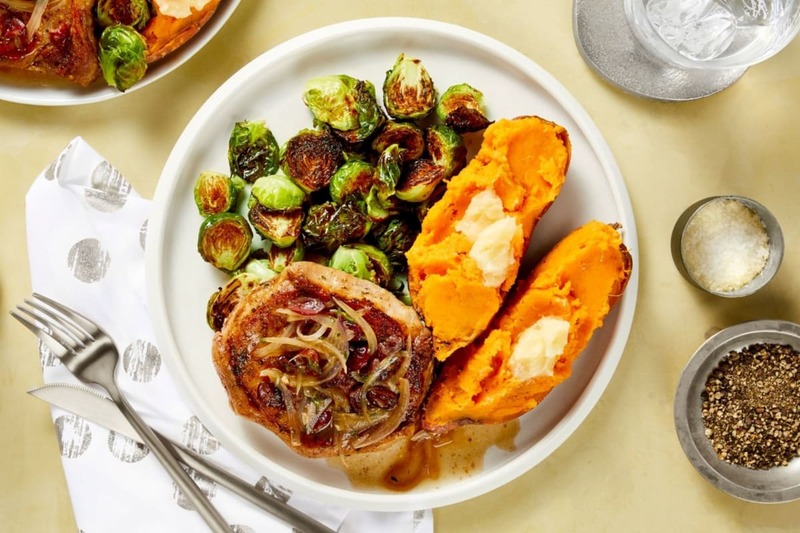 Roasted Brussels sprouts and speedy baked sweet potatoes slathered in honey butter. Best of fall flavors, delivered! Adjust rack to top position and preheat oven to 425 degrees. Wash and dry all produce. Finely chop 2 tsp thyme leaves. Trim, then halve Brussels sprouts. 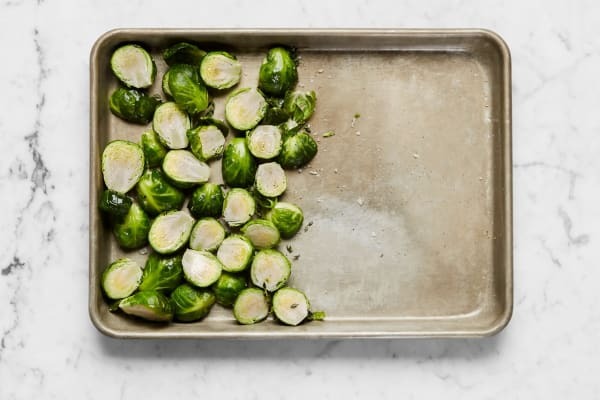 Toss on a baking sheet with a large drizzle of olive oil, 1 tsp chopped thyme, salt, and pepper. Roast until lightly browned, about 10 minutes. Meanwhile, poke sweet potatoes on all sides with a fork. Place in a large microwave-safe bowl and microwave until slightly softened, 3-4 minutes. Let cool slightly. 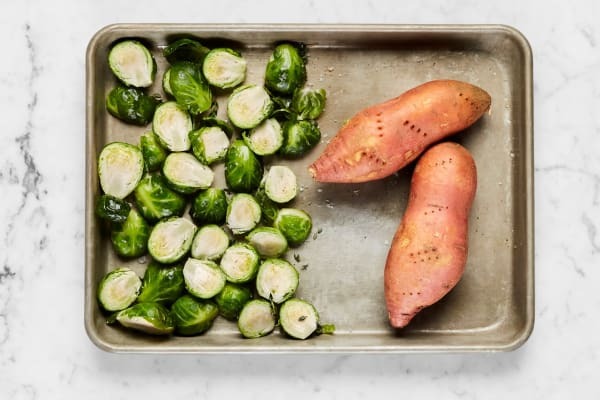 Once Brussels sprouts have roasted 10 minutes, add sweet potatoes to baking sheet. Return to oven until veggies are tender, about 10 minutes more. Meanwhile, pat pork dry with paper towels; season all over with Autumn Spice, salt, and pepper. 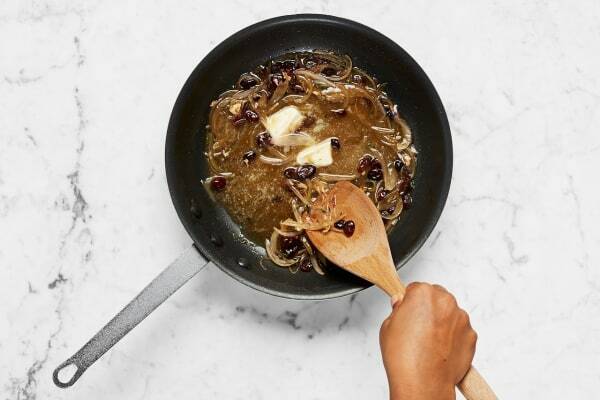 Heat a large drizzle of olive oil in a medium pan over medium-high heat (use a nonstick pan if you have one). Add pork and cook until browned and cooked through, 4-6 minutes per side. Turn off heat; remove from pan and set aside. Wipe out pan. Halve, peel, and thinly slice shallot. Heat a drizzle of olive oil in same pan used to cook pork chops over medium-high heat. Add shallot, remaining chopped thyme, and a pinch of salt and pepper. Cook, stirring, until slightly softened, about 1 minute. Add stock concentrate, cranberries, and ¼ cup water to pan. Reduce heat to medium low. Simmer until thickened, 1-2 minutes. Stir in 1 TBSP butter and any pork resting juices. Turn off heat. Place 2 TBSP butter in a small bowl. Microwave until softened, about 10 seconds. Stir in honey; season with salt and pepper. Cut sweet potatoes lengthwise; fluff insides with a fork. Divide pork, sweet potatoes, and Brussels sprouts between plates. 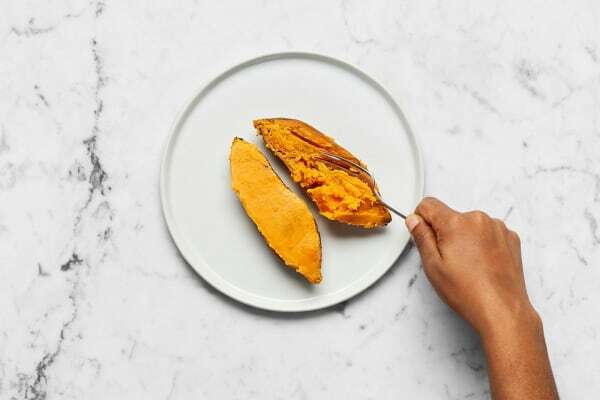 Top sweet potatoes with honey butter. Top pork with sauce.